Market Forces is working hard to get climate change on the agenda of Australia’s biggest companies. As part of this work we help shareholders and their proxies attend the annual general meetings (AGMs) of fossil fuel companies and their financial backers. This allows them to directly challenge board members on the environmental and human rights impacts of their businesses. Thanks to hundreds of generous donors to a Market Forces crowdfunding campaign, Gomeroi traditional owners and farmers from Narrabri were able to attend the Santos AGM in Adelaide in May 2018. 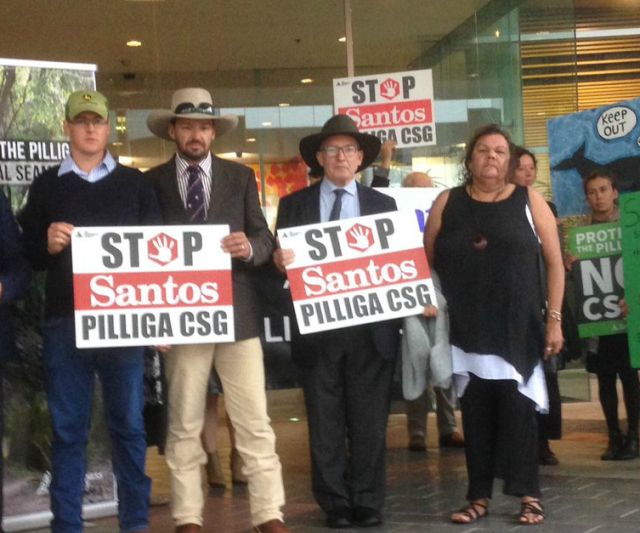 They directly challenged Santos’ board over its planned unconventional gas project in the Pilliga (Billiga) Forest, which has faced years of fierce community opposition. Farmer Adam Macrae spoke of the danger the project poses to the Great Artesian Basin – the biggest underground water source in the world – and vowed Santos would face a rural uprising if they proceed. The community will ‘stop at nothing to stop this project dead in its track,’ he said. 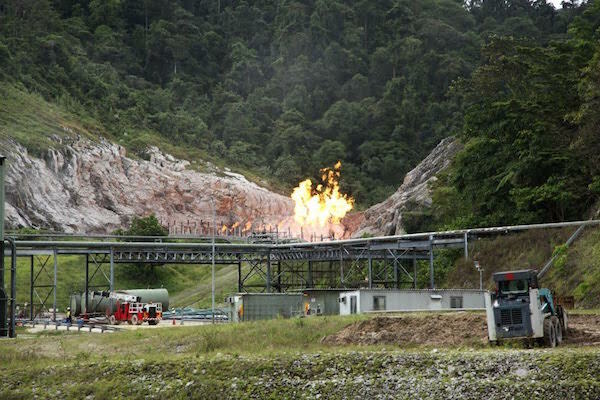 Market Forces also coordinated a resolution lodged by 115 shareholders asking Santos to disclose its fugitive methane emissions. This was backed by shareholdings worth roughly $1.2 billion, despite Santos’ board recommending a vote against disclosure. Shareholders asked if the bank’s loans to West Australian oil and gas producer Quadrant Energy and other carbon-intensive companies had been tested against 2°C – Warne said fossil fuel investments would be first to be done. Warne claimed he had known about the recommendations of the Taskforce on Climate-related Disclosures (TCFD) last year – he’d just been unfamiliar with its acronym. Our video footage shows otherwise. Click to read our full report on Macquarie’s 2018 AGM. Market Forces co-filed this resolution with Local Government Super, a $10 billion superannuation fund. Votes in favour of QBE disclosing climate risk equalled $2.6 billion in shareholder capital – a major rebuke to QBE for its failure to act so far. Chairman Marty Becker dodged a shareholder’s question on whether his board agreed that extreme weather would impact on QBE’s financial bottom line. QBE has not been approached to insure Adani’s controversial Galilee Basin coal mine project – chief executive Pat Regan said QBE doesn’t usually underwrite thermal coal mines in their development phase. Acknowledging the clarion call from investors on climate risk, Pat Regan said work would begin ‘right away’. In August, QBE released its plan to implement the TCFD recommendations – a great example of the power of shareholder activism. Read our full write up of QBE’s 2018 AGM. Suncorp’s chairman Ziggy Switkowski acknowledged the importance of a series of climate-related questions from shareholders and the role of Market Forces in bringing such issues to the fore. Confirmed Suncorp’s dumping of fossil fuel investments was on track to become ‘completely immaterial’ as promised in 2017. Read our write-up of Suncorp’s 2018 AGM. AGL shareholders, representing $600,000 worth of investment, asked the board to confirm it would still shut down its Liddell coal-fired power station in 2022, despite the abrupt departure in August 2018 of CEO Andy Vesey after a high-profile spat with the federal government over Liddell’s closure. The board confirmed it would close down Liddell as planned. Western Port residents challenged AGL over its proposal for a massive LNG project at Crib Point, a Ramisar-designated wetland area of international significance. “We don’t believe that we have stranded assets,” said Woodside chairman Michael Chaney when shareholder questioned the viability of the company’s $2.5 billion Scarborough gas field in Western Australia, described by Carbon Tracker last year as ‘at risk of stranding on a 2°C economy pathway’. Shareholders asked whether AMP would join 30 other financial institutions that have ruled out loans to Adani’s Carmichael mega coal mine – acting chair Mike Wilkins said shareholders could have ‘some confidence’ in the fact that AMP hadn’t been approached – although did not categorically rule it out. Sydney Airport chairman: Still above water so we’re in good shape so far! Officially, Sydney Airport supports the TCFD framework. Despite some confusion among the board as to whether it had signed up, and the CEO’s attempt to ignore a shareholder’s question about implementation, it appears the company has so far done little about it. Read our full write up of the Sydney Airport AGM. Do you have shares in Sydney Airport or any other Australian companies? Sign up here to help us improve climate risk disclosure. Listen to Sydney Airport chairman Trevor Gerber dismiss concerns over sea level rise risks to runways. Oil Search touted its expansion plans and existing assets in Papua New Guinea and Alaska’s North Slope as resilient and expected to generate positive shareholder returns under a 2°C global warming scenario. This was despite the oil and gas company’s own 2017 Climate Change Resilience Report clearly showing its assets are impacted and eroded under both 1.5°C and 2°C. CSR is a major ASX100 building materials company. It also owns just over 25% of Australia’s largest aluminium smelter, Tomago Aluminium – the single biggest consumer of electricity in NSW. Although CSR has identified climate change as a material business risk, it has released little detail in its mainstream reporting on the types of risks considered and the implication of those risks on financial performance. At its 2018 AGM, CSR’s chairman dodged answering the critical question of when they would produce a scenario analysis in line with the 2ºC Paris Agreement. Read our full write up of CSR’s 2018 AGM. FAR, an Australian oil and gas explorer operating mainly in Senegal, finally accepted the importance of climate change as a business risk in 2018 – a remarkable turnaround from chairman Nicholas Limb’s shocking statement in 2017 about the goal of “quantifying… 2ºC is laughable in the extreme” – a statement he now denies making! Click to listen to the audio and read our full report on FAR’s 2018 AGM. Fracking company Sundance Energy gave a flat ‘no’ when asked by shareholders at its 2018 AGM if it planned to sign up to the TCFD recommendations or do 2°C scenario analysis. Nor does it intend to disclose methane emissions in its mainstream reporting or sign-up to the global Clean Air Coalition principle on reducing methane. This is despite Sundance’s board admitting it is aware of the potential legal implications of climate risk. Read our full Sundance 2018 AGM write-up. AusNet Services own and operate the Victorian electricity transmission network, which is mainly powered by brown coal in the Latrobe Valley. Its $11 billion of assets are therefore highly exposed to future policy shifts and technological changes in response to climate change. Yet when pressed over its commitment to the TCFD framework, the board refused to say whether it would sign up, despite claiming that climate change ‘is certainly a priority’ for AusNet. Read our full write-up of the 2018 AGM.